Geoinformatics enters into a Joint Venture with Redton Resources Inc. covering 118,000 hectares of contiguous claims in the Quesnel Trough, British Columbia. 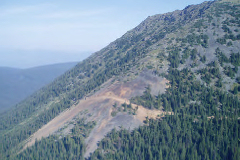 The Quesnel Alkali Gold-Copper Project falls in the Quesnel Terrane of British Columbia, originally an island arc environment, within which are found a number of large alkali Au-Cu porphyry and calc-alkali Au-enriched Cu porphyry deposits. The Quesnel Terrane was once contiguous with the very similar Stikine Terrrane, in which are also found large, gold-rich alkali and calc-alkali porphyry deposits. The project area lies on the Nechako Plateau in central British Columbia, between the Omineca River in the north, and the Nation River in the south. 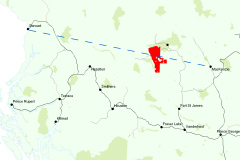 It is approximately 250 kilometres north west of Prince George, and is accessible by road. It lies midway between Placer Dome's Mt Milligan alkali gold-copper porphyry deposit and Eastfield Resources Ltd's Lorraine porphyry copper deposit, and covers the same complex of rocks which hosts these two deposits. This is the view northeast across the Red Zone on the Takla-Rainbow Prospect, which forms part of the project area.